What a ride it has been with headphones for me in the last 4 months or so. I do have to thank the headphones for getting me back into enjoying music after my hiatus of 4 years of virtually never listening to music other than my car. I've acquired too many too fast but enjoyed every one of them along the way. It was really great to have done countless hours with various headphones and various headphone amps to discover exactly what it is that I enjoy, like and dislike in headphones. Obviously some will stay but many have been sold so others can enjoy them. I can consider my headphone collection complete at this point as there is nothing else that I would want at this point. The collection was given a thorough evaluation, a shakedown and at the end only a few pairs will stay for the long haul. 1. ZMF Auteur. What a gorgeous, completely handcrafted set in gorgeous Blackwood. Beautifully balanced top to bottom with deep and well articulated bass that emphasizes quality and articulation of bass vs over-abundance or quantity. Engaging, drawing me deep into the music and not wanting to let go... Skillfully tuned for a balanced response that offers resolution and detail without drawing attention or over-emphasizing the presence or brilliance region. Vibrant and colorful without sounding "colored". This set replaced my Focal Utopia in the long run. The Utopia was a very impressive headphone but ultimately I found it to be too analytical and hyper resolving and that doesn't work for me long term. What a pleasure to admire this gorgeous pair of ZMF taking them out of their wood presentation case and before even putting them on. 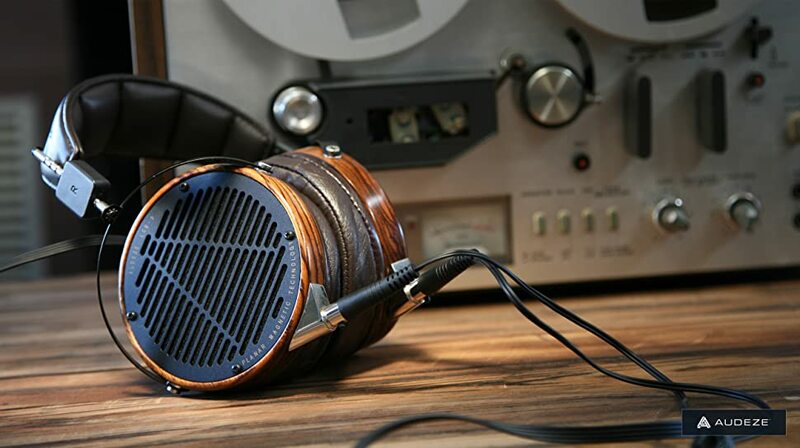 Artfully and skillfully crafted by the small but talented team at ZMF headphones, this pair is what I would consider heirloom quality and I am proud to have the Auteur in my collection. 2. Audeze LCD3. This is my go to headphone for late night Jazz listening. Warm, lush, seductive, musical and hopelessly romantic set that can never be called neutral and neither would I want that from this set. It is just honey on the ears with my favorite Jazz recordings when I am in a totally relaxed state. The supple leather ear cups and the wood cups of the LCD3 is also a pleasure to both admire and wear in comfort. 3. Fostex TH-X00. This is my go to headphone for listening to Rock and other higher energy music. Healthy dollop of sub-bass that is both powerful and deep but totally keeps out of the frequency band above it, without coloring the upper bass or lower midrange. Nice kick to the skull when the mood is right and totally addicting pair for anything with a higher tempo and adrenaline filled music. Bam!! Feel that bass! Never harsh, never fatiguing, presence and brilliance region are spot on for my taste so this set can be enjoyed for extended listening sessions without fatigue. 4. Sennheiser HD600. A good old friend. Just can't part with this one. It does everything so right without actually being a master of anything specific. It's like a good, worn in pair of shoes, you just put them on and forget they are there. Total comfort, total relaxation with any genre, anytime, anywhere, for everything! 5. E-MU Teak. This is my favorite headset for portable/non-dedicated headphone amp use. Plenty of efficiency at 106dB and low impedance lends itself well for iPhone use when I want to listen to music outside my typical listening space. Non-fatiguing, smooth treble and midrange with also a very healthy kick down low but the bass on this set does encroach just a bit into the lower mids making them slightly colored and chesty sounding but ultimately a fun set for non-serious listening to virtually any genre of music and especially music with great bass for fun. 1. PrimaLuna HP with EL34 in Triode mode for serious tube magic. 2. Audeze Class A Deckard for desktop use. 3. Luxman L-590AX MK II Class A for occasional late night listening. 4. Woo Audio WA6 with Sophia Princess and 13EM7 tubes. So that is my collection today and I have no further plans to expand or change anything at this point. Last edited by PHC1; 02-15-2018 at 10:05 PM. Very nice congrats great list of cans you got! LMAO ...........Serge, you remind of the Lay's Potato Chip commercial..... 'betcha can't eat just one' !! Pretty sure I am done Dave. Thanks! Yeah, LCD3 is awesome if you like a lush and romantic sonic signature. It has been fun to follow your journey Serge! Thanks Tom. I still love headphone listening, that’s never going to change except now I split my free time between the main system and the headphones. Nothing like a late evening/night Jazz session in headphones. Very intimate and relaxing. I get totally absorbed by the music. The glow of tubes from the Woo Audio amp I posted about separately is mesmerizing and the sound is intoxicating, warm and very engaging. Something about tubes that just creates listening magic in headphones especially. Serge, great collection. It’s interesting to see what you ended up keeping of all the headphones that went through your hands. I see the MrSpeakers didn’t make the final cut, and you don’t have the Woo in your final list. Tony, Woo is here to stay, I have not updated my signature yet. I had to organize my collection by use and function. What headphones with what amps and where and why... etc... I hate stuff laying around not being enjoyed so it all goes for sale so someone else will. The Mr.Speakers Aeons didn't make the final cut because I still kept coming back to the HD600 for a laid back and relaxed listening or reaching for the LCD3 for a more vivid and harmonically rich presentation. I still think they are very good headphones, they simply did not find much use in my collection to keep them long term. Awesome collection, nice to have a choice of toys to play with. Makes me want to reconsider doing something better for my desktop again, possibly using a small tube amp.